It is time, at last, to talk about ties. You may have wondered at my lack of any substantial information on the subject thus far, considering that firstly, ties are a large part of Dressing Like a Grownup; and secondly, that Your Genial Host devotes a large portion of his time to designing and tailoring said neckwear. 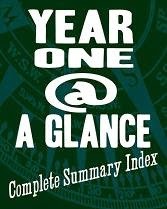 Indeed, other than the passing mention, the only installment dedicated to neckwear has been nothing more than a cursory overview of tying basic knots. The reason is simply this: it is far too important a subject to enter into lightly, without a firm grounding in the history of the subject. Any Average Guy can slap any old tie on a shirt and look like an adult -- but knowledge, as they say, is power, and a firm grasp on the history of neckwear will give you a sartorial advantage over, well, most everyone else on the planet. There are also some interesting blossoming trends in men's fashion that have undiscovered roots in centuries of history, and to take full advantage of this, it is best to know the source material, as it were. We shall begin in the early 1500s. Neckwear was certainly in use before that time: exempli gratia, ancient Romans used a focalium, or neck cloth, to protect their throats against inclement weather. But as the ancients used neckwear as a necessity against cold or swords, not as fashion, we may skip ahead until that time that the shirt-collar became both functional and decorative, which was the Elizabethan ruff. The ruff started simply enough, just the natural ruffle formed at the neck of a shirt by a drawstring. When shirts became more tailored, with neckholes and buttons instead of drawstrings, the ruff at the neck remained; this time as a changeable piece of cloth that protected the shirt and was washed separately. By the mid-1500s, the ruff was purely decorative, and could be quite elaborate, with double or triple layers, and of linen or trimmed in lace. It was the development of starch, though, that permitted the ruff to achieve a greater level of purely artistic expression. Cone-shaped goffering irons were heated in the fire and applied to heavily-starched ruffs to set them into the characteristic figure-eights that gave them their high lofts. 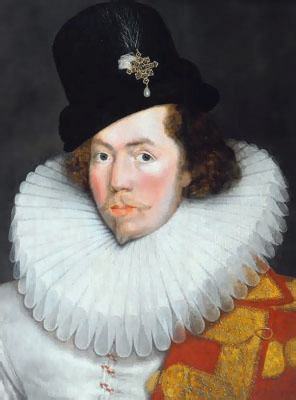 In the 1570s, ruffs were not overly wide, but starch allowed an impressive three to four inches in height from a single ruffle, that extended from shoulder to ears. It may look overly fussy to us today, but the new fashion of thin, delicate fabric standing out seemingly in defiance of gravity must have seemed magical. (These two groupings of men are details taken from the Somerset House Conference of 1604, but their conservative ruffs illustrate well the styles from the 1570s.) 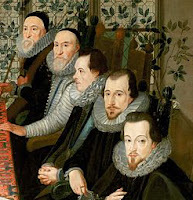 These gents demonstrate single, double, and treble ruffs, with goffering varying from tall and narrow to short and wide figure-eights from lightly starched and rather loose to thin and very stiff. The fellow on the end below wears his ruff tipped in lace. "Starching houses" made a good business of washing, starching, and setting ever more elaborate ruffs, testing the limits of the science on the great and imaginative variety of ruff styles. 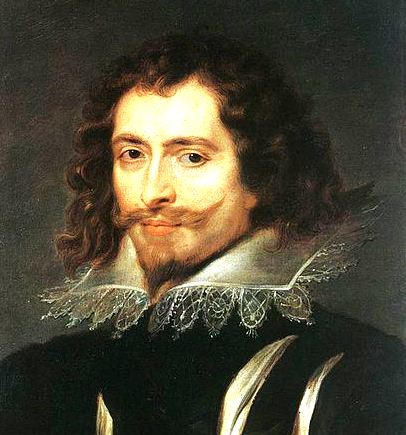 In the 1580s, it was natural that ruffs would expand outward as well. Thin "cartwheel" ruffs, a foot or more wide, became en vogue; but the limits of starch had finally begun to be reached. 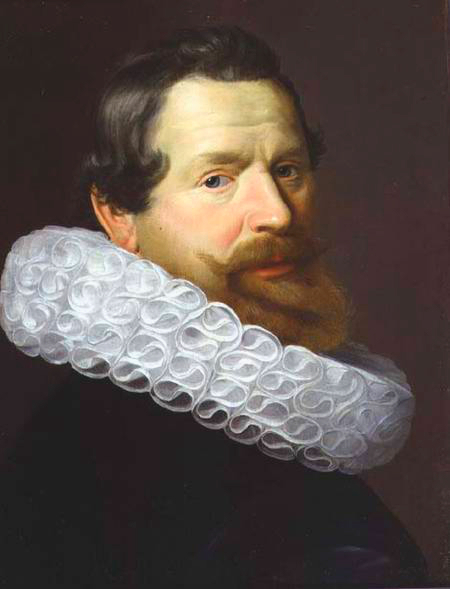 To hold the ruff in place, "supportasses" or "underproppers" were developed, frames of wire or cardboard to keep the ruff from drooping or breaking. At this point, the harmless frivolity that was the ruff became more trouble than it was worth. What started as simple protection for the shirtcollar -- light, elegant, and comfortable -- became overencumbered and overengineered with its own necessary infrastructure. 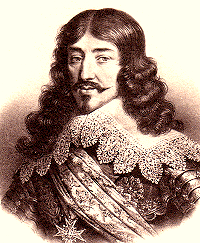 Fortunately, the ruff had not much longer to be fashionable, (save in Holland,) thanks to Louis XIII. Quite simply, he wore his hair (natural or wigged) long -- and the one thing you can't do with a wide ruff, is wear it with long hair. The King favored wide flat lace collars that covered the shoulders. The ruff lived on (in unstarched form) as the "falling ruff," that laid over the shoulder in imitation of the flat collar -- after all, if you have a perfectly fine (and pricey) ruff, you don't just throw it out; you make it work within the current fashion. Detail of Reubens' George Villiers. For those who liked the effect of the old high ruffs, a unique solution was to wear a collar with a wire sewn within its perimeter. This "wired collar" would stay aloft without benefit of starch. The flat collar pervaded for several decades in various forms, now wider, now narrower, now lacier, now plain, as the political climate of the 1600s dictated. The falling collar, narrowed into two rectangular bands of plain linen, remain in use today as British barristers' collars. 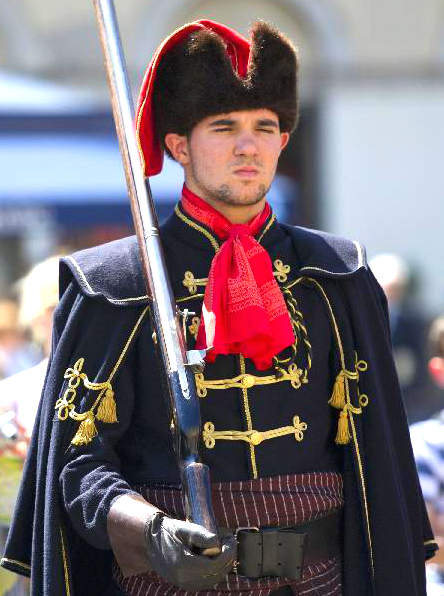 Modern Croat soldiers still wear the cravat. 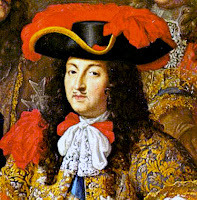 The next evolutionary jump in neckwear was brought to France in 1660 by Croatian mercenaries employed by the King. They wore broad colorful scarves, neatly knotted at the neck. The French became enamored of it, (as the French are wont to do,) and adopted the style for their own. They called it, naturally, a Croat, and favored its use in white lace and linen. The pronunciation became Anglified to Cravatte when Charles II brought word of the new fashion back to England after exile. Method of wearing a Steinkirk. Most historians draw a neat parallel between the ancient cravat and the modern long tie, and there are notable similarities, but there is more to the story than that! 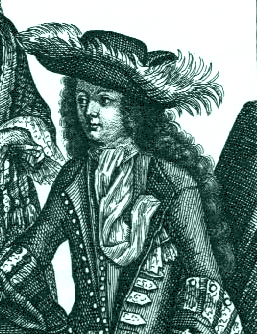 During the Nine Years' War in the late 1600s, there was another refinement of the cravat. The French replaced their broad, flowing, lace cravats with hardier plain cloth that was much longer and narrower, fringed on the ends, for their military dress. It was wrapped once around the neck and tied in a loose knot. The fringes were twisted together and tucked through a buttonhole of their coat, to keep it out of the way. It got its name from the bloodiest infantry battle of the war, from Steenkerque in the Southern Netherlands -- and the Steinkirk cravat, loose, long-ended, with the ends often (but not always) tucked away, remained popular with both sexes until the 1720s. Then, another change, again brought about by military fashion. Choiseul, Louis XV's Minister of War, changed the troops' steinkirks to stocks. The first stocks were made of stiff horsehair, more like a collar than a cravat; they wrapped around the front of the neck and fastened at the rear with buckles. The reason was as much practical as fashionable; it was in fact meant to serve as neck armor. They were very stiff, reinforced with whalebone, and worn rather tight: so tight, that in the early years the hapless soldiers were so constrained as to render the head nearly immovable, and stooping was impossible. Fortunately, civilians were under no such constraints, and the stock was adopted and worn as a gathered, pleated, or simply folded band of muslin, wrapped around the neck and buckled, tied, or pinned at the rear. 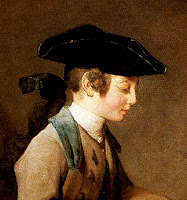 Hairstyles played a part in neckwear as well: from 1720 onward, hair (natural or wig) was worn long, brushed back and tied with a black ribbon at the nape of the neck. The hair was often gathered in a black silk "bag wig," which could be pinned to the stock or attached to ribbons that were brought to the front of the stock and tied in a bow. The stock could have an attached ruffle at the front; imitating the look of a cravat. The youth in the above image wears his hair tied back but un-bagged; his stock is as tall as his collar. 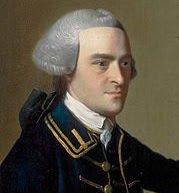 By the time of Hancock's portrait, at left, (who, you will note, is wearing his hair in a bag wig,) collars are starting to be folded over the stock. The stock would appear to be a step backward in the development of the modern tie, as it isn't actually tied at all, just wrapped and pinned. It was comfortable and easy to wear, so its use lasted nearly a century. In the waning years of the 1700s, however, the cravat was poised to make a comeback. And next week, we'll look at that comeback, and what came of it. Stay tuned! 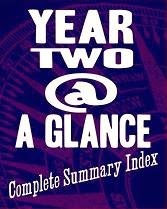 Click here to go to the next essay chronologically, Part Two of The Secret Life of the Tie.